That’s about what I have the wherewithal for at the moment. It seems that I don’t respond any better to having blood drawn on an empty stomach than I ever did. But that’s the important part, anyway. Thank you for all the hand-holding. I can’t tell you how it helped me. A very great deal. Our wonderful friends insisted on taking the Bean after all, and he clearly had a great time, including his first non-mom co-bathing experience. I wish I could have been there — they are a very appealing pair — but I suppose it’s good for him to have some adventures without me. Even if they are adorable adventures. I was quite taken aback when I came into the office, as it has been severely renovated since my last visit, to the extent of replacing most of the drippier naked lady paintings with aggressively green poppy wallpaper and adding an additional floor. Then came all the rigmarole about being out of my insurance network, the end result of which was my charging an astronomical amount to my credit card, 80% of which I very much hope will be coming back to me (although even 20% is significant). I have made peace within myself about this problem, but lord if every new receptionist and billing person doesn’t have to process with me about it. The doctor was nice enough. I’m not sure I love her, but that is more a once-burned situation than anything I can pin on her. I imagine I will come to like her fine. She said the right things and didn’t rush us, she just also didn’t emote at me the way my main doctor here did when I told her about my adventures with Dr. Russian. On the other hand, I also wasn’t crying, shaking, or refusing to make eye contact. So her response was fine for the situation. Sugar does not seem concerned, and she is a better judge of this sort of thing. 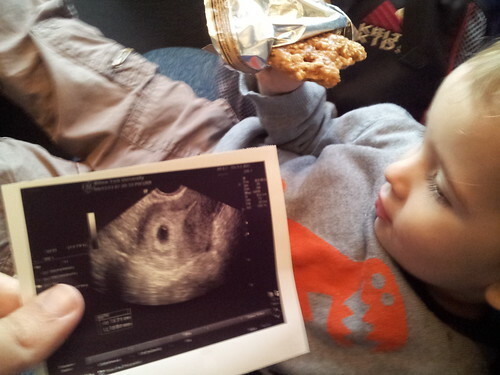 The blood draw was for the nuchal business, which is coming up very soon. That scan will be at the high-risk place with the fancy machine. Assuming all goes well (and I am too relieved right now not to enjoy that assumption for a bit), perhaps we will get a better picture than today’s. Well, maybe better isn’t the word. Limb-ier. The critter does seem to have limbs and even to be able to wave them about, but that view was not committed to ink and paper. I suppose we will just have to actually remember it, imagine that. Categories: back in the saddle, dildocam, doctors, just the pictures, radiology, Uncategorized, up the duff | Permalink. Happy Monday, internets. I hope you are well. I am well but nervous. I’ve done a pretty good job, I think, at just relaxing and practicing belief and all that jazz vis-a-vis this month without medical reassurance of this probable pregnancy. It would be untrue to say I haven’t fretted at all, but most days, I’ve been okay. Fertile people do this all the time! And they are fine! But today is the day. I am nervous for all the reasons you’d expect, gentle readers. I am afraid I am not really pregnant. I am afraid I’m being pregnant wrong. I am afraid this doctor, whom I have not met before (the known nice one wasn’t available for this appointment because of our travel schedule) will yell at me. I’m afraid I will get bad news in front of the Bean and never stop crying. A friend has offered to watch the Bean, but I’m afraid to take her up on it because it will surely mess up her own toddler’s evening schedule and then she will hate me. At times like these, nothing will do like the comfort of food. I did not want to eat at all, but some small, beleaguered zone of rationality in my brain informed me, repeatedly, that this was a very bad idea. It moved my body around the kitchen until iced tea was in my glass, new water in the kettle to refresh the supply, grits* and eggs were boiling in their pans. The fretful majority of my grey matter distracted me into overcooking the egg (I favor a five-minute one with grits), but the rest survived. 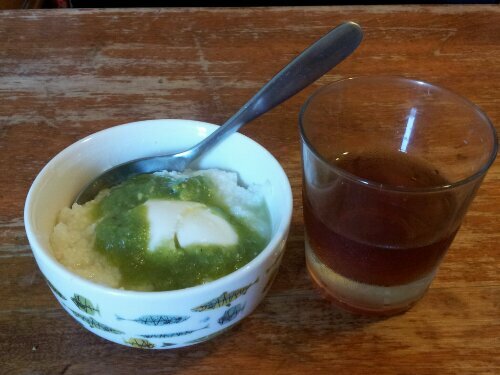 A little leftover salsa verde from this weekend’s trip to the Red Hook ballfields made everything go down easy; bland food gives my stomach too little to think about, and it starts making up problems. And so, onward. Eight hours to go. Categories: back in the saddle, come and eat, doctors, eats, just the pictures, my addled brain, on the home front, up the duff | Permalink. Dateline: Northeast Corridor, aboard Amtrak regional train. 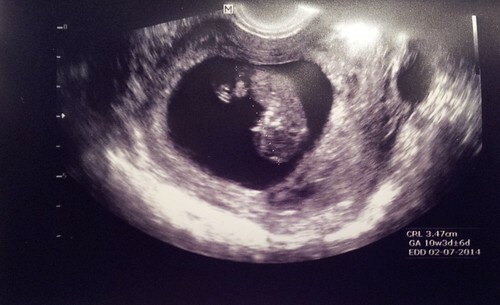 The Bean and I are presently riding the rails southwards, which means, yes, the “where’s embryo?” scan went well. Three cheers for that! It was indeed to early for a heartbeat, but we saw a sac with a little yolk sac in it, in my uterus. “With numbers like these, where else would it be?” Asked Dr. Paternalistic. I know he is right, but I have had too many friends have ectopic pregnancies to truly believe they are as rare as the statistics say. Not as good a picture as if I’d scanned it, but there really is not much to see. And this way you get verisimilitude! So. Off we go on our adventures. I am requested to organize a progesterone blood test while in Little Rock, but that’s it. No ultrasounds, for instance, until July 15th at the OB’s. A month! And no one seems to have any problem with that! It’s like being a fertile person, except for the huge amount of luggage space devoted to crinone. Categories: back in the saddle, dildocam, doctors, radiology, Uncategorized, up the duff | Permalink. Gosh, internets, thank you for all the love and enthusiasm. Warms the cockles, I tell you what. Background Item: Since the Bean was born, I have been on Sugar’s health insurance (Aetna, lifetime health cover loading), first because I wasn’t working and then because I wasn’t working in the right place to have my own. However, that insurance doesn’t have the kind of gold-plated fertility coverage I require, so this spring I accepted two night classes with a wretched commute in order to return to my old insurance (Empire Plan) long enough for an FET or two. This coverage ends in late August, at which point I will be back on Sugar’s plan. Item: I screwed my courage but good and called the office of the nice OB — you know, the one who said four hours of pushing didn’t mean I wasn’t trying and used the word “horrified” more than once as I quivered on her exam table, trying to explain why coming in for a Pap smear had me so anxious. I like her a good deal and trust her about as much as I’m currently able to trust any member of her profession (midwives included, I’m afraid), and even so, I was quite dizzy with nerves as I waited on hold. (This bodes well for the coming months, eh?) I finally made it out of the holding tank and then through the nine million questions necessary to schedule early pregnancy appointments (knock wood, practice belief, knock wood), at which I point I casually mentioned that my insurance had changed since my last visit. Guess who doesn’t take my current insurance, only six or so plans with remarkably similar names? After a lot of phone calls and mental math, I decided that the cost of seeing the good practice for a couple of out-of-network visits before returning to their accepted Aetna plan (three, I’m guessing) is lower than the cost of patching my mental health back together if I have to find a new practice, even just for a couple of months. I have a few hundred dollars of deductible to cover, after which my insurance will pay 80% of “reasonable and customary” charges; someone from billing is supposed to call me back this week, but she sounded like she thought they would likely work with me to charge amounts my insurance finds acceptable. This will still end up costing us quite a bit more than seeing someone in network, but therapy ain’t free, either. Especially at a time when I can’t avail myself of the kind sold in fifths of a gallon. Item: I am suddenly outside the bounds of my coverage at the Baby Factory, despite not being released as a patient yet. My insurance considers the Baby Factory in-network for fertility care only, not for pregnancy care. This seems like no big deal, since the Baby Factory doesn’t do OB, but it did cause me some stress three years ago, when I started bleeding after they had released me but before I’d found an OB. At that point, Empire Plan considered a heartbeat on ultrasound as the boundary between fertility and obstetrics; I had a first beta, a second one week later, saw a heartbeat two weeks after that, and was sent on my way. It all seemed perfectly reasonable. We know too well that a positive first beta does not mean a Real Live Baby, but the rate of miscarriage drops significantly after a heartbeat. Imagine my surprise, then, when having been relieved of yet another vial of blood this Sunday, I was handed a bill for the second beta (and progesterone and estradiol just for fun, I guess), to the tune of $300 and change. We can send it out to a lab your insurance pays for, said the lady in billing, but you won’t get results quickly. My cheapness fought my anxiety; cheapness is strong, but anxiety has throwing stars. So even though I had a sinking suspicion I wasn’t pregnant anymore, I decided to bet on good fortune and pay the bill, hoping that money would count against the deductible I’d spend at the OB’s anyway, assuming I got there. My father’s family has been going to this particular place on the shore of Lake Superior for a bit more than hundred years; there’s a gathering of cousins there planned for the end of June. We go there rarely, and I so want the Bean to see it. It is so beautiful, I won’t even pretend to do it justice in a rushed blog post except to say that it is what I picture when I think about heaven. And I’m not really a cold weather girl. It is also quite remote. The only telephone is several miles from where the cabins are; the nearest hospital certainly over an hour. It is sublime, but it would be a hell of a place to have an ectopic rupture. I asked Dr. BF back in March what he thought of our going the on the heels of a May cycle. As long as your betas are unambiguous, he said. If they look potentially ectopic, I might have to tell you to stay home. Fair enough, I agreed. Just because this place is like heaven doesn’t mean I want to die there. All this time, I’ve been refusing to quite believe that this trip will happen as planned, but the plan is to leave on Friday. (We are going to a wedding in DC, then to Sugar’s parents’ in lower Michigan, then to the UP, then home (Sugar) and Arkansas (the Bean and me, to see my mother). It’s quite the odyssey, even by our standards.) So after the first beta, I called Dr. BF to remind him of our deal, and that this means we will not be in town for their preferred viability ultrasound at something like 10 days past the second beta. Happily, many phone calls later, it transpires that the prices of everything except the progesterone test are within the bounds of “reasonable and customary.” I confess shock that the blood tests are, frankly, and suspect this has less to do with chemistry than lab monopolies, but whatever, not my (immediate, individual) problem. Item: The plan. Scan Thursday, very early so that Sugar can come before work. Probably too early to see a heartbeat, so we’ll try not to think about that part. I will see if I can sweet talk a nurse into jiggering the schedule so that we get the fellow I like instead of Dr. Paternalistic. If not, I guess I’ll live. On the other hand, this might be my last chance to kick him from the stirrups…. Item: this post is absurdly long. Sorry. Item: I think that today I entered the part of pregnancy when I can’t have coffee anymore without feeling really sick. This lasted for the duration last time, and boy, is caffeine a more important part of my life with an early-rising toddler than it was pre-Bean. Item: This morning also marked the first convincing nausea of this process (doxycycline excepted). Not so bad, as these things go, but still not my favorite. Item: I’m not sure if this quite rises to the level of a craving yet, but holy Moses, is beef all I want to eat in the whole world. I could have wept for joy at the sight of hamburgers grilling at Sunday’s pool party. Item: this post is absurdly unstructured. Sorry. ME: Many people do not consider ice cream a breakfast food. BEAN (thoughtful, serious): Maybe some do. Categories: back in the saddle, doctor's orders, doctors, dr. baby factory, insurance, kips bay baby mill, my addled brain, my hoo-ha, radiology, the bean, Uncategorized, up the duff | Permalink. I was so sure I wasn’t. But here is the rare occasion when I am happy to be wrong. Doubling time of 34.94 hours. Hard to argue with that, even for me. Sugar, the Bean, and I are on our way to a birthday party in the suburbs (baby’s first pool party!) so the myriad ways my insurance is giving me grey hairs and the Bean’s latest sleep shenanigans will have to wait for a future post. But I did not want to leave you hanging, my loyal friends. Categories: back in the saddle, I vf?, insurance | Permalink. Just in case, you know, I’m not pregnant anymore tomorrow, when I return to the baby factory for a repeat beta, I thought I’d better post these. One is from Sunday a week ago. Yes, after I’d already gotten the call, because I couldn’t adequately gather my courage to do so before the phone rang. There were two in the box, so it seemed perfectly reasonable to pee on the other one on in the middle of the week, when I was feeling particularly un-pregnant. And promptly fret that its line looked lighter, even though I know (I know!) that isn’t how these things work and anyway, it’s not as if I’d controlled for hydration and so on. Anyway, now that one looks darker, so who the hell knows. Categories: back in the saddle, Micturition Chronicles, Uncategorized, up the duff | Permalink. I was going to write you a whole story, including the inauspicious movie ad by the clinic (“This Is The End”) and the auspicious way the hotdog stands smelled AMAZING, how I bought hpt’s so that I could pee on a stick after the blood draw but before the phone call (and in so doing learned that the 42nd street CVS sells honest to god vibrators), only then I sat there, next to the open box, crippled with indecision about whether or not to test, given that Sugar was off working a shift in my stead at the food coop and so on, and then the phone rang…but like me when the nurse on the phone asked how I was feeling, you would probably prefer that I dispense with the pleasantries. 221, for those of you who like numbers. Prime factors of 13 and 17, which I like. That seem auspicious, even I must admit. Categories: back in the saddle, Uncategorized, up the duff, what we need more of is science | Permalink.